The Bulgarian Muslims have demanded the conduction of an emergency Muslim conference, overseen by representatives of the EU member states. The reason for the demand is the reinstatement of Nedim Gendzhev as the Muslim religious leader in Bulgaria. Muslims from the Bulgarian town of Kardzhali gather Saturday for their fourth peace protest against the decision of the Supreme Court of Cassation. The protesters claimed they do not support Nedim Gendzhev, who has been imposed on them by the court, and they want to choose their own religious leader. Next week, a delegation of Mufti, Imams and members of the Muslim Board of Trustees will go meet with the President of the European Commission, Jose Manuel Barroso in order to discuss the problems of Muslims in Bulgaria. According to the protesters, the Bulgarian state is exerting pressure on the Muslim population. They claimed that the National State Security Agency (DANS) and the police continue to interrogate on various topics delegates from the Muslim Conference held in 2008. The Muslims also stated that there have been anti-Muslim suggestions in the country. Among the accused are Volen Siderov, leader of the Bulgarian nationalists party Ataka, the Chair of the Parliamentary Commission for control by DANS, and the Bulgarian Minister without Portfolio, Bozhidar Dimitrov, who is responsible for the minorities in the country. The Muslims from the Bulgarian city of Plovdiv have called for the minister’s resignation because, in their words, he has been working towards the division of the Muslim society in the country. 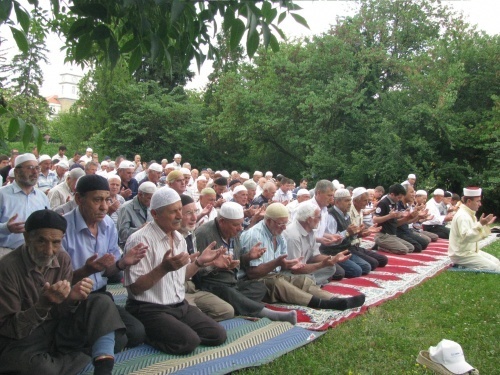 “We call for the Bulgarian government to stop postponing and take actions to prevent the image and prestige of the country being hurt, and the peace of the Muslim community to be violated,” the protesting Muslims in Kardzhali said.